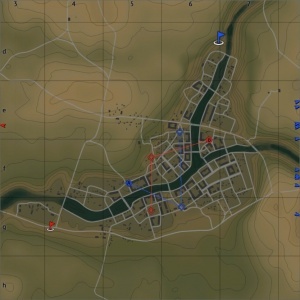 Eastern Europe is a ground forces map available in all modes. It was added in Update 1.45 "Steel Generals". 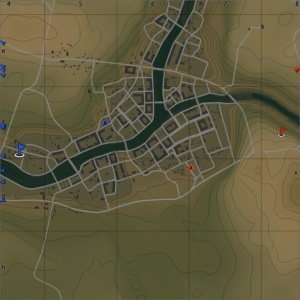 The map is based around a (fictional) Eastern European town. 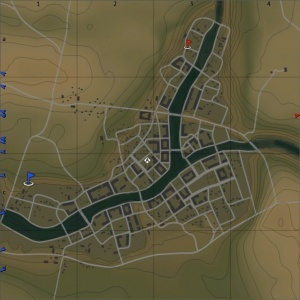 The town (and indeed the map as a whole) is split by a river which runs across the map, just south of the middle. The town consists mostly of two story buildings, with reasonably wide streets. There are a total of six bridges (within the town area) linking the north and south of the map. The bridges on the outside of the town are furthest from the likely combat zone, however they can leave the player more exposed than some of the other bridges, so the likely position of enemy tanks should be considered when choosing a crossing. In the center of the south part of the town there is a slightly more open area, with a few buildings and defenses facing towards the north, this area often acts as a capture point. The north part of the town is slightly less dense, with more open areas. The north provides a good way of outflanking players in the south, however players in the south can easily return fire if you get caught in the open. North of the town is a fuel depot, on top of a hill, players are open to enemy fire while approaching the depot, but once there it provides a commanding view of the map, allowing you too shoot at tanks in the north and south of the town, as well as the open area to the south of the town. South of the town is an open area with trees and hills to provide cover. Players can use this area to get shots into the sides of their enemies, and ambush players on their way from their spawn. East of the eastern spawn point there is a large hill which tank destroyers and other vehicles can use to engage players in the south and north of the map at long range. 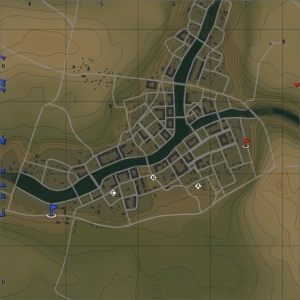 The full tank map is 4km x 4km (although the battle area is usually restricted to just the town). The air battles area is 65km x 65km. Warring armies are spoiling for a fight. only a small town is dividing them. It seems that no stone will be left unturned. This map is a fictional location set in Eastern Europe. This means the likely combatants would have been Soviet and German forces. There are three Capture Points. Point A is closest to the right spawn area, B is closest to the left spawn area, and C is right in the middle, all in the south half of the town. There is one Conquest configuration of this map, with one Capture Point. It is located in the middle of the north half of the town. There are two capture points, each owned by one of the teams. Point A is at a storage depot in the south and point B is in the middle of the northern half of the town. One capture point will be in the south west of the northern half of the town, and another will be in the north east of the town, where the river splits. When captured they will unlock a capture point in the west (opposite the southern hill of the island) and in the east (opposite the northern hill of the island), respectively. When captured these points unlock the final capture zones, located in the north of the northern half of the town, and the west of the southern half, respectively.